Cloudy skies and rain are expected to make their way across South Korea, while fine dust levels could rise in the capital, Chungcheong provinces and Gangwon Province in the morning due to an influx of smog from China carried by northwesterly winds, according to the Korean Meteorological Administration Tuesday. Rainfall of less than 5 millimeters, or snowfall of around 1 centimeters, is expected in Seoul and central parts of the country, which may clear fine dust particles in the daytime. 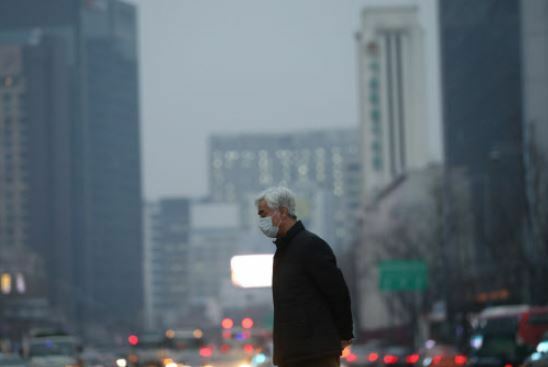 Seoul’s fine dust levels had exceeded 79 micrograms per cubic meter as of 8 a.m., while 122 micrograms per cubic meter was recorded in Incheon, 87 in North Chungcheong Province and 98 in South Chungcheong Province, though the levels are expected to ease in the afternoon. Morning temperatures in Seoul remained at zero degrees Celsius with daytime highs expected to be 4 C, weather forecasters said.